National Geographic Special: Quest for the Lost Maya re-aired October 2013. Archaeologists unearth a previously unknown Maya civilization in southern Mexico. The Maya's soaring pyramids, monumental cities, and mythical mastery of astronomy and mathematics have captured our imaginations and spurred generations of explorers into the jungles of Central America on a quest to understand them. And after centuries of scientific exploration, we thought we had a pretty good handle on who they were. But in the past decade, researchers working in Mexico's Yucatán Peninsula have made a series of startling discoveries that reveal a gaping hole in our understanding of the Maya. What we thought we knew about the Maya could suddenly turn out to be just half the story. Cave drawing of a jaguar. Quest for the Lost Maya follows American archaeologists George Bey and Bill Ringle and their Mexican colleague Tomás Gallareta Negrón as they find startling evidence of a forgotten Mayan society in the Yucatán. Buried beneath an ancient pyramid deep in the Yucatán jungle, the team discovers an even more ancient royal palace complex. Then, they unearth a massive stone acropolis that rises nearly 30 feet above the jungle floor and is crowned with a ceremonial platform the size of four football fields; it could have held thousands of people. 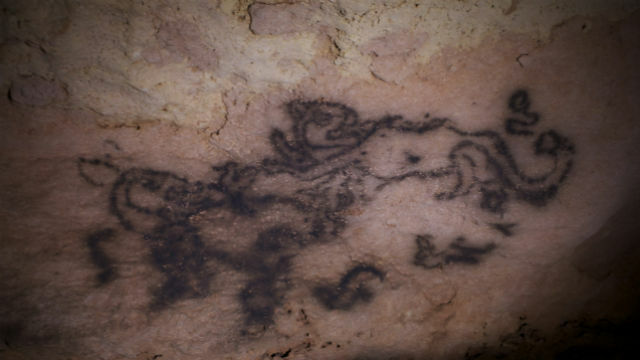 And, nearly 300 feet underground, they discover cryptic cave paintings that may be among the oldest Mayan iconography ever discovered in Mexico. Previously, scientists dismissed the Maya of the North as the poor stepsister of the southern Mayans. They believed the northerners were a small, splinter group from the more famous Mayans of the South and that their society developed over 1,000 years after the South's. But all of these new finds in the Yucatán suggest the North was a far bigger, far more important and far older society than originally believed. The film follows Bey and his colleagues as they seek to get a handle on this lost Maya society: Who were these mysterious northerners and why did history forget them? Along the way, the team discovers another odd clue: a series of massive hilltop manors. Weird thing is, these extravagant houses were not royal residences, but appear to have been owned by non-royal farmers. Could this be evidence of the Americas' first ever middle class, emerging a full a millennium before 1776? Bey's team also tackles other perplexing problems. They discover that at their zenith, the North's cities boasted a population density comparable with modern Los Angeles County. Yet, the region of the Yucatán called the Puuc, where most of the northern Maya lived, has no natural water sources. So how did the northerners manage to build a massive civilization in a waterless environment? And as extraordinary as the existence of these northern Mayans is, it is their demise that has the team completely baffled. In an ancient northern town called Kiuic, they find clear evidence that the northern Mayans abandoned their cities en masse. "In archeology, it's extremely rare to find such clear signs of rapid abandonment," explains Bey. Yet at Kiuic they abound: An unfinished palace structure with stones selected and laid out by masons, ready to complete a second story wall, and pots and grinding stones placed carefully into storage in homes, as if waiting in vain for their owners' return. Around A.D. 900 something led the northern Maya to abandon wholesale the magnificent society they'd built. But what? A drought? Political instability from the collapsing society to the south? Warfare, or all of these? Bey and his team unearth some stunning answers and National Geographic is there to record them. National Geographic Special: Quest for the Lost Maya was produced by National Geographic Television. © National Geographic Television. All Rights Reserved. Photos courtesy of National Geographic Television.